UK rail and bus operator Stagecoach has agreed to sell its New Zealand operations for 250.5m New Zealand dollars (£100m; US$171.6m). The business is being bought by Infratil, a specialist investor in infrastructure and utility assets. Stagecoach's New Zealand business runs services in the Wellington and Auckland areas of New Zealand, and ferry services in the Auckland area. Stagecoach said it would use the proceeds of the sale to cut debt. "We concluded that the disposal was in the best interests of our shareholders," said Stagecoach's chief executive Brian Souter. "We are continuing to explore the potential for complementary acquisitions in the UK and North American bus markets," he added. 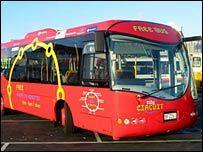 In the UK, Stagecoach operates about 7,000 buses, has two wholly-owned UK rail franchises - South West Trains and Island Line - and has a 49% shareholding in Virgin Rail Group, which runs the West Coast and CrossCountry franchises.